It's not really about the numbers, though. Well, scratch that. It is about the numbers, but it's nice to know that my words aren't going off into the interweb void, never to be read once they've been posted. The people that are coming onto my site may very well not be reading a lick of it, but... that's just it. I don't know what they're doing. I don't know who you all are or where you're from, and that's ok. I'm grateful for the traffic. Of course, feel free to leave me comments. I'd love to hear from you all and get to know you! :) It's always exciting when people get involved. Anyways, that's all for now. I just figured I'd give you an update on the foray into twitter land. ADDENDUM - I lied. That's not all for now. I said some odd amount of posts ago that I was going to see District 9 as my next movie. 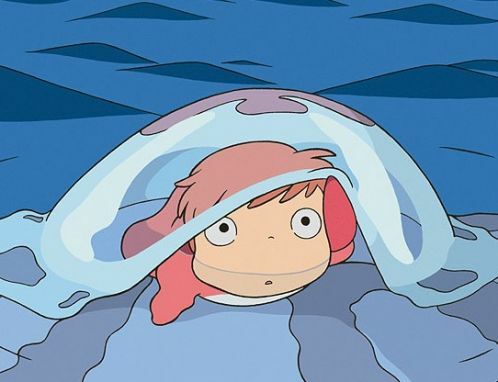 Well, as it turns out, my next movie venture will be Hayao Miyazaki's "Ponyo." I've been looking forward to this for a long while mostly because I just love Miyazaki's body of work so much. Howl's Moving Castle, Spirited Away, Kiki's Delivery Service, Princess Mononoke (Yes, I'm an anime dork, but not horribly so.)... They're all wonderful. Not only that, but the cast is great. Either way, I'm very much looking forward to it. Miyazaki never fails to entertain, and I'm certain he won't drop the ball with this Little Mermaid adaption. Your blog is great, I really have to work on mine to get it set up. I am on twitter also promoting traffic to my blog. twitter is wonderful. It's a fantastic way to meet wonderful people, many of them fellow writers. Do hang out and take part in the #writechat and #litchat sessions - you get to meet and interact with agents, editors, publishers, and all kinds of generally wonderful people. And thank you for being so welcoming to Twitter! It's always nice to go somewhere new and meet people who are genuinely kind. I will definitely be taking part in the #write/litchat sessions whenever I can.